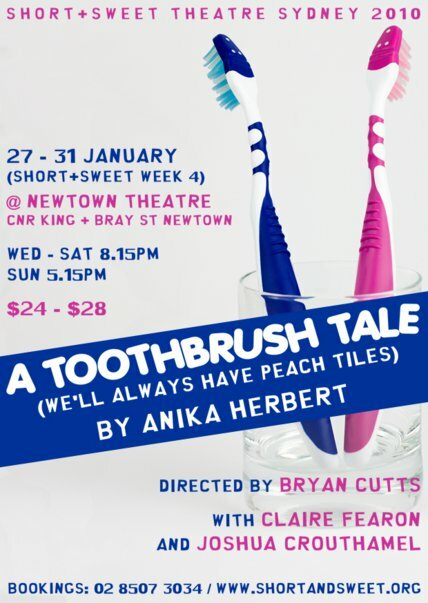 On Sunday 31st January 2010, Anika Herbert’s cute comedy ‘A Toothbrush Tale (We’ll Always Have Peach Tiles)’ finally closed the week 4 proceedings at Short and Sweet Theatre Sydney. At the conclusion of the night, the industry judges’ votes were announced; first place was awarded to the wonderful ‘Life of Death’ by Nir Shelter, and Lisa Eismen’s tense drama ‘Black Jack and Diane’ secured the second judges’ placing. Herbert’s work, brought to life under Bryan’s direction and starring Claire Fearon and Joshua Crouthamel, grabbed 3rd place! and ‘A Toothbrush Tale’ secured second place! First place was again given to ‘Life of Death’, while third place was awarded for the hard work of the team who brought ‘Ladies Bootcamp’ to the stage, written by Brooke Fairley. A full report of the voting can be read here on the Short and Sweet website. And make sure you continue to support this terrific festival by attending the rest of the season. Tickets can be purchased here.